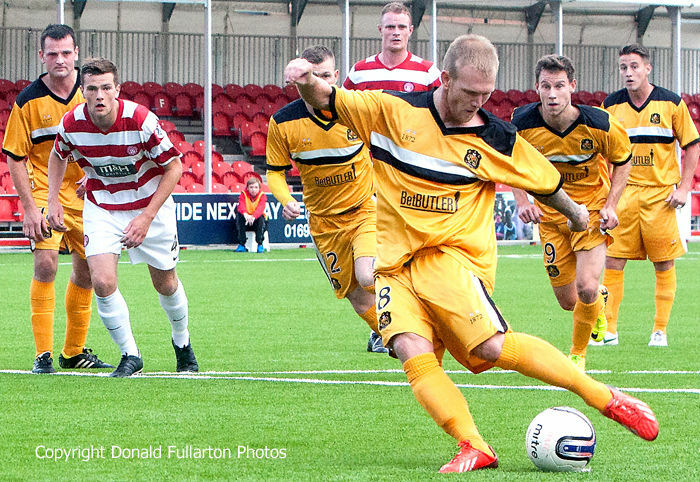 DUMBARTON'S confident start to the season came to a sudden halt at lop-sided New Douglas Park, Hamilton, as the Accies ran riot. While a steward tried to ensure that two Dumbarton photographers did not obscure a 15 feet wide advertising board, Sons produced their worst performance since manager Ian Murray came to the club last November. In the first half the visitors were totally flat, with one exception. Keeper Jamie Ewings produced some fabulous saves, including two from ex-Sons no.9 Jon McShane, and it took 28 minutes before he was beaten. Card-happy referee Kevin Clancy considered an Aaron Barry tackle in the box to be worthy of a penalty and a yellow card, and diminutive ex-Celtic striker James Keating scored from the spot. Two minutes later he knocked in a second goal after a brilliant Accies move went from one end of the field to the other. Garry Fleming and Jordan Kilpatrick replaced Steve McDougall and Kevin Smith at the interval, and Sons were much more competitive in the second period. On 67 minutes it was their turn to be awarded a penalty, and Scott Agnew netted confidently from the spot. The travelling support hoped for a comeback, but it was not to be. Accies regained control of the midfield and scored in 72 and 77 minutes through Grant Gillespie and Tony Andreu to ensure a well-earned three points for the full-timers. The picture shows Scott Agnew netting the penalty.